The company is a well-known Manufacturer, Exporter and Supplier of Plain Cashew Nuts in Palanpur. The Plain Cashew Nuts, offered by the company, are hygienically processed and properly packed products. 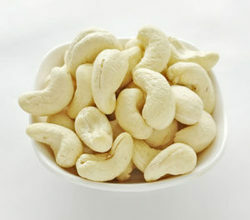 The company offers the best Plain Cashew Nuts at the best prices and the delivery is always on time. The different grades supplied by the company are W-180, S-180, W-210, S-210, W-240, S-240, W-320, S-320, W-400, S-400, JH, S, JK, LWP, SWP AND BB. Founded in the year 2008, Sunco Cashew Company is a renowned firm of the industry indulged in manufacturing, exporting and supplying finest quality Cashews Products. We are manufacturing Cashew Kernels, Raw Cashew Nuts, Cashew Nuts Shell Liquid and Roasted Cashew. These cashew products are processed at our processing unit by using high quality cashews and latest technologies based machinery. Highly admired by our worldwide consumers for their freshness, longer shelf life, high nutrition and delicious taste, these are exceedingly demanded in national and international market. These are highly used in food and beverages industries. Besides this, our dexterous team helps us in understanding the growing diverse needs of our patrons to fulfill accordingly.